Why should an Indian startup incorporate in Singapore? With PM Mr. Narendra Modi, India has implemented more pro-business policies and incentives to encourage foreign investment, and Singapore plays a very important role. 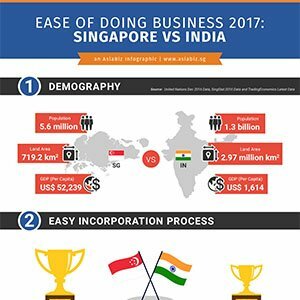 In this infographic, we provide a comparison of the ease of doing business in Singapore VS India. Thousands of companies rely on us to get started. Fast. Coupled with qualified specialists and superior service, your company registration is made easy. Singapore’s Declining Industries – Company Formation 2014 Review: Singapore’s Startup Ecosystem 2017 Should you set up your business in Singapore or Indonesia? Singapore VS Australia – which market is best for your business?